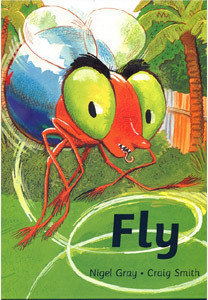 This is a newer edition of a book of the same title previously published by Macdonald in the UK and illustrated by Mike Dodd. Dad is having a quiet nap when he is disturbed by a buzzing fly. He tries to swat it with a rolled-up newspaper but the nimble fly escapes, leading Dad on a merry dance. The fly finds himself in all sorts of trouble – and so does Dad.